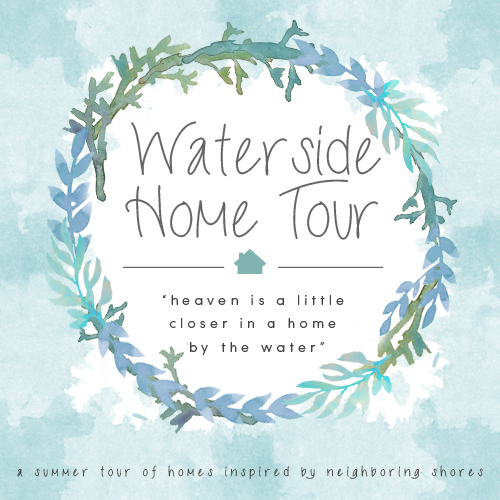 When Emily from Table and Hearth asked me to be part of a Waterside Home Tour I responded yes immediately. You know I love the ocean and adore sharing photos on Facebook and Instagram from my morning runs. Yesterday I shared part one of my home tour and today I’ll share wit you a little more of our space. I’m in love with blue and white, which will be glaringly obvious to anyone looking at these photos. Our dining room is one of the least finished rooms in the house but despite the fact that we have very little furniture in there it doesn’t stop me from enjoying this view every time I walk through the room. AJ and I bought this silhouette of Drew during a fundraiser at his pre-school… I love it because it is so perfectly him. The house’s color scheme was built around this gorgeous print from Minted. I adore the blues of all shades in it. I figured we could have loads of white and light gray in some rooms, with just a touch of navy, and for others, like the office, we could really use navy as a “wow!” color. The dogwood branches are from a tree in our yard that needed some trimming. Aren’t they perfect? I’d love to switch out that light fixture with something with a little character but it’s working until I find the perfect piece. I love some of these options at PB Teen but can’t seem to make up my mind for what style I want in here. For right now I just have a mirror leaning up against the sink. It’s too small but I love it so it’ll do until the perfect one is discovered. I had these goals of having this space finished months ago but I’d rather have it unfinished for a while longer instead of just settling for something to complete it. The office is nearing completion (I feel like I keep saying that). Just a few more things to check off the list (some extra painting and purchasing these chairs in light gray and we can call it a day… and probably replacing the lighting fixture since it’s not a dining room in here anymore). I love how the watercolor of our past home looks with the rich navy in here! We are selling the couch on the opposite side of the room to make room for the chairs (faux leather, $150, good condition… and perfect for kids! Anyone want it? :)). Once that sells the room will feel really bright and light even with the darker walls. I think the light gray chairs will be perfect with the rug. Lastly, let me share with you one last spot of our main floor… the eating area. A little over a year ago the florist for our wedding contacted me and told me her business partner was getting rid of this table and asked if I wanted it. Ummm… yes! I painted it white and now we eat on it every night. I’m just waiting for these chairs to come off of back order and then six of them will sit around this table, I think that will look fabulous… the natural wood paired with the white! (If you have a natural colored table look at this option on sale in white… $131 for a set of two!) I’m going a little crazy having white slipcovered chairs with messy eaters… I’m washing them constantly. I’ve had them since before I met AJ so I don’t feel too bad about parting with them. Have I mentioned before how I’m so completely in love with the gardens at this house? We can cut fresh peonies, dogwoods and even little white flowers I don’t know the name of! This road is one of the most stunning places I’ve ever been. It’s incredible at low tide (below) and at high tide you can have the sound of the water on the rocks. Sometimes I’ll stop and do sprints at this straightaway because I don’t want to leave the water. We typically go to White Beach when we don’t have much time to spend but need our beach fix. The car can be parked close to our things making it incredibly easy to unload with the kids. Yesterday Drew was begging for some time at Singing Beach which is about 2.5 miles away. It’s definitely bigger and busier but nicer for spreading out. Last night we were coming back from looking at a flip potential and decided to go to Singing Beach to let the kids run and jump in the waves. Pants are apparently optional in Elle’s case. Let’s see the fabulous ladies on this tour line up… From the sneak peeks I’ve been seeing on Instagram I know I’ll love them! Thank you so much, Kaylor! Happy Sunday! I love the use of dark and light you have put into your home. I’m totally in love with your skylights. We are debating skylights for our home. Beautiful beach photos. I love your dark walls and light decor!! I have a fan coral art piece as well, but on wood. Yours look great on the fabric!! Great tour. What an inspiring post. Your home is lovely… loving the details you shared that you most cherish throughout your home. So cool how near you are to the beach, too!! And it’s great that it’s convenient… especially with kiddos!! Its amazing how beautiful the ocean is in the summer, love the photos of your child playing in the sand, you have a very pretty home, so classic and simple. Its been a pleasure meeting everyone in this great waterside post. Your home is inviting and inspiring. I love how you balance the crisp and dark colors. Thanks for sharing. I am pinning for future reference. Have a wonderful week at the ocean. Oh my gosh, those views are amazing Jen! And those pops of navy you’ve used are so nautical and perfect with the rest of the decor 🙂 Thank you so much for hopping on the tour!! Oh wow! I love the contrast of the moody walls with all of your pretty and neutral styling. The beach pictures are awesome!! Thanks for sharing. Thank you so much, Kathy! I love the contract of the light and dark too… it makes it more interesting I think. I’m finding that I’m brainstorming how to add a touch of navy to each room to pull the house (or at least the common areas) together. Your home is lovely and you have given me the boost to go ahead and start posting pictures of mine at Celebrate & Decorate now, and not waiting for everything to be “finished”. I know the patience of having to wait for backordered items, it took months to get our sofas, our dining table and I am still waiting for a slipcover for a chair. I had been thinking I need to wait until it is all “done” to share. I can relate so well to your home in progress. Your home is lovely. I love how you used the navy in your office. I tried to talk my husband into turning our formal dining room into an office for one of us, but he wouldn’t have it, but it is interesting, that is the room we painted a dark blue, Marine Blue from Benjamin Moore. I am subscribing and have pinned this post to my Home Tours board! Post the in progress! Definitely… and then just share your vision for how the space will progress. I totally realize I will have bare photos and people may not be able to see my vision but then every home tour it’s so fun to look back and see great progress. oh, my goodness; that beach pic of your husband and kids would make a great Waterlogue watercolor I bet!